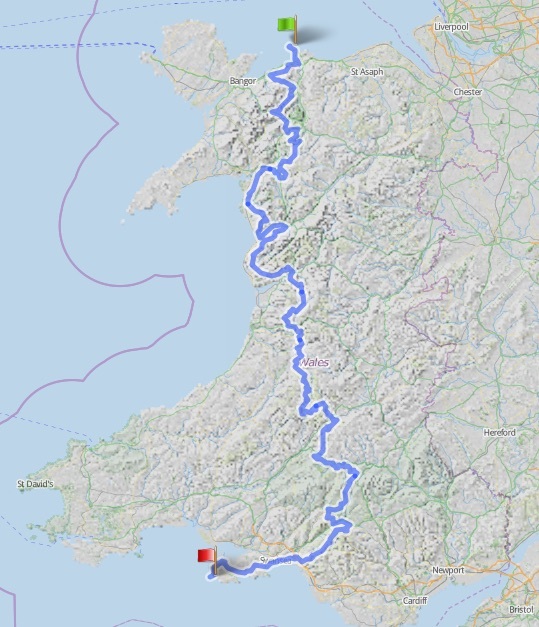 The Cambrian Trail is the finest and hardest unofficial coast to coast off road cycle route in Wales. Running from the Great Orme in Gwynedd to Worm’s Head on the Gower, the route covers over 500 km of some of Wales’ finest off road trails. This is a serious route with a substantial amount of climbing and tracks of varying surfaces. It is intended to be toured over several days. Experience of riding challenging terrain over multiple days is essential. The Cambrian Trail route makes use of public rights of way and other tracks over which the public have a right of way by bike. The Route is presented “as is”, and no warranty or guarantee, implied or otherwise, is given as to the condition that you will find the route in. The route was tested in its entirety in April 2015 by a group of five riders. See the Completions page for details. Attempting to ride all or part of the Cambrian Trail is strictly at your own risk, and the route authors and website curators accept no liability for any damage, loss or injury sustained during or arising from your attempt or completion of the trail.